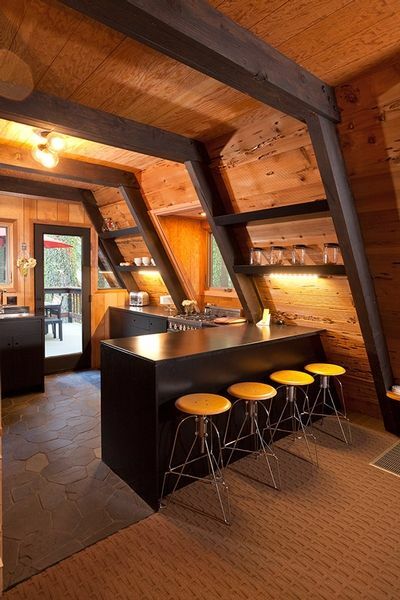 When considering a log cabin in the woods, no one dreams of a cookie-cutter floor plan lacking in individual character. We want magical living spaces which have a sense of enchantment. 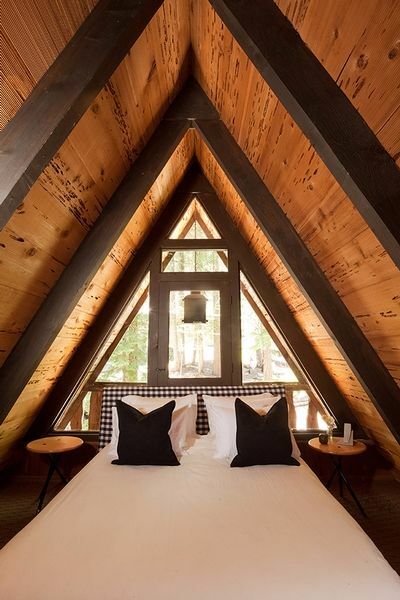 A-Frame cabins are fundamentally different to traditional log cabin constructions; they have their own quirks, and can often appear to have come out of a fairytale. 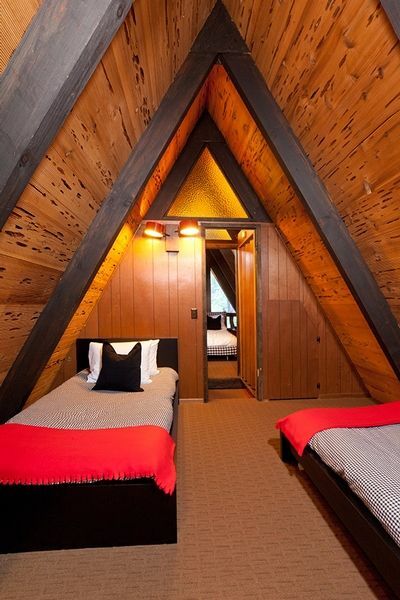 Originally built in 1969, Homewood is an A-Frame cabin which was re-imagined by Popp Littrell Architecture + Interiors. 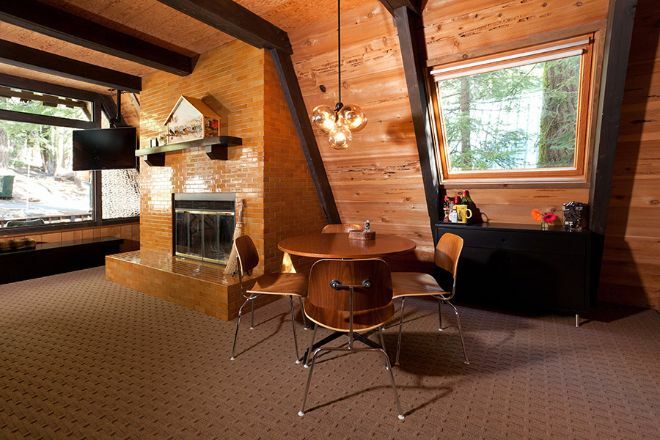 The floor plan retains a lot of its retro charm alongside more modern fixtures and fittings. 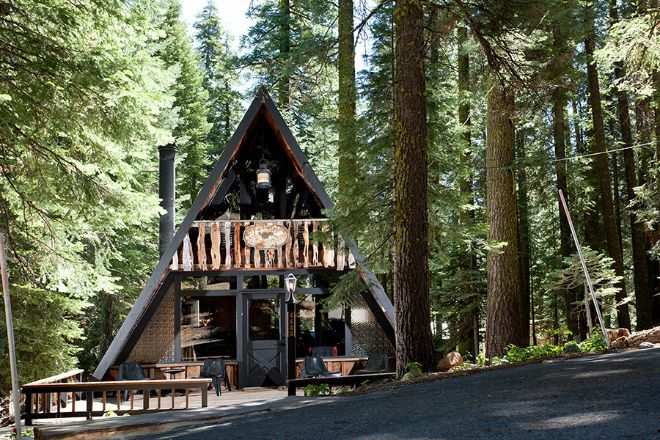 This cabin is located in the woodland region where California meets Nevada, close to the largest alpine lake in North America: Lake Tahoe. 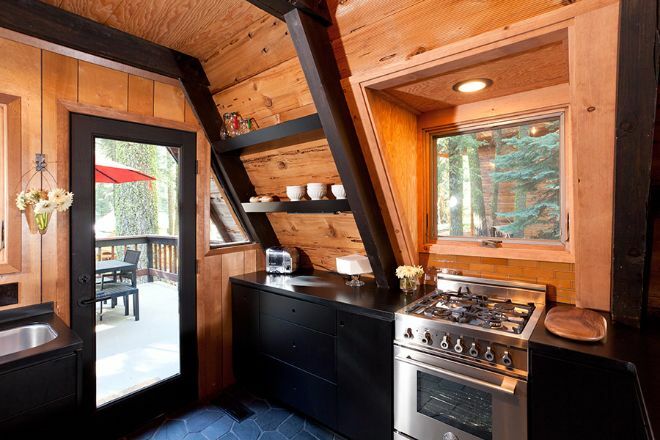 This interesting cabin has 1,200 square feet (111.5 square meters) of living space, with two bedrooms and one-and-one-half bathrooms. Shall we take a look? 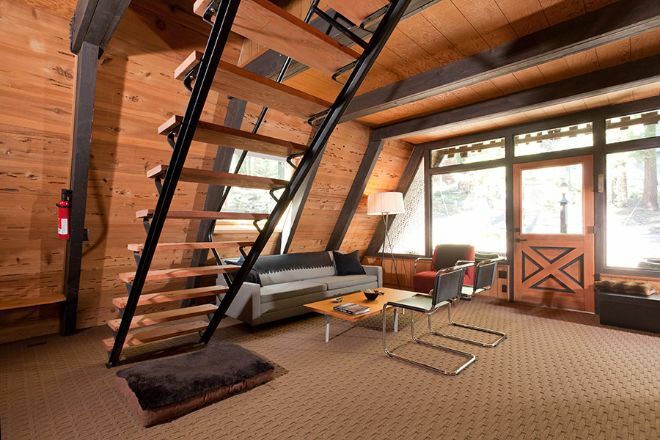 This eye-catching cabin sits among soaring alpine trees in this abundant nature area. 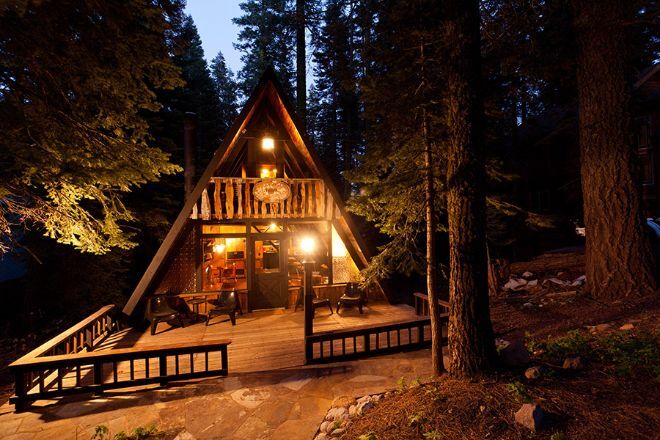 The cabin at night has the sense of a luxury camp, with the constant feeling of living outdoors. 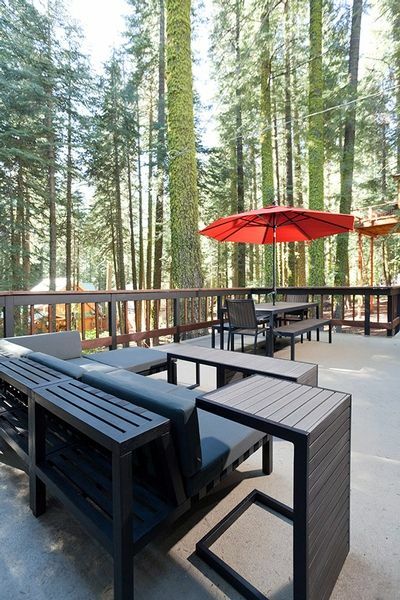 The spacious porch is a liveable outdoor space, with a dining set and a lounge area. Inside the house, we find a spacious living room with a tasteful design which perfectly complements the wood finish. The large windows at the entrance ensure the living room is well lit throughout the day. The designated dining area has ample room for a large table. The commanding fireplace effortlessly heats the room and has an interesting tiled finish. The modern kitchen looks sleek and clean with its black cabinetry. Efficient European-style appliances are integrated into the cabinetry to create an uncluttered cooking space. The cupboards conceal a refrigerator and a dishwasher. 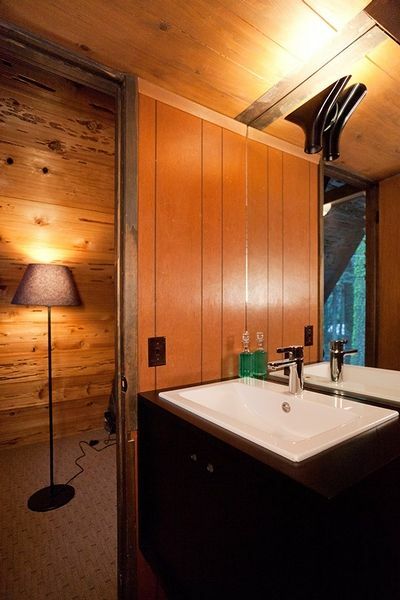 The bathroom benefits from well-appointed fixtures. 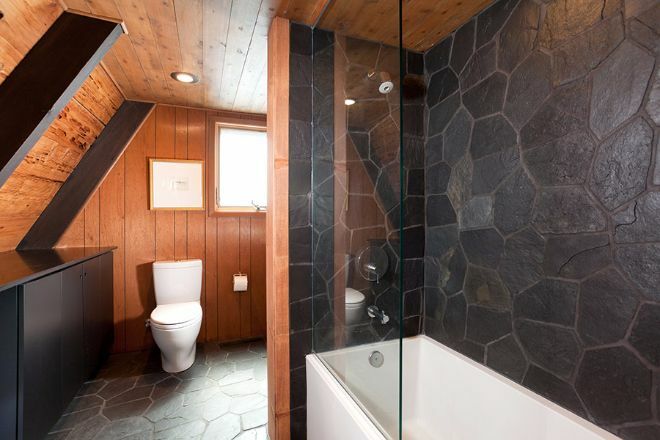 The dark slate on the floor and walls is a very attractive feature. The sleek black cabinets on the left conceal laundry facilities. The two bedrooms within Homewood are located on the second floor. The guest bedroom is a simple minimalist sleeping space with two single beds. 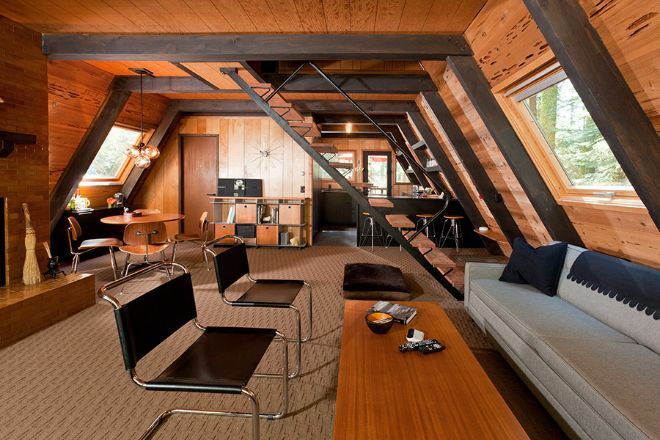 The master bedroom has a modern platform bed and benefits from a gorgeous triangular window. 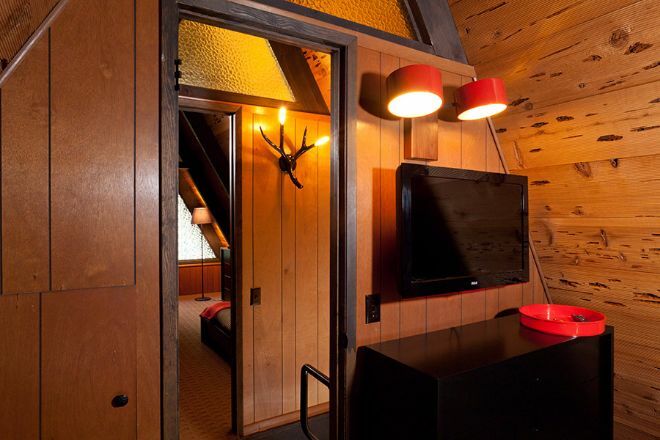 The cathedral ceiling gives both bedrooms ample headroom. 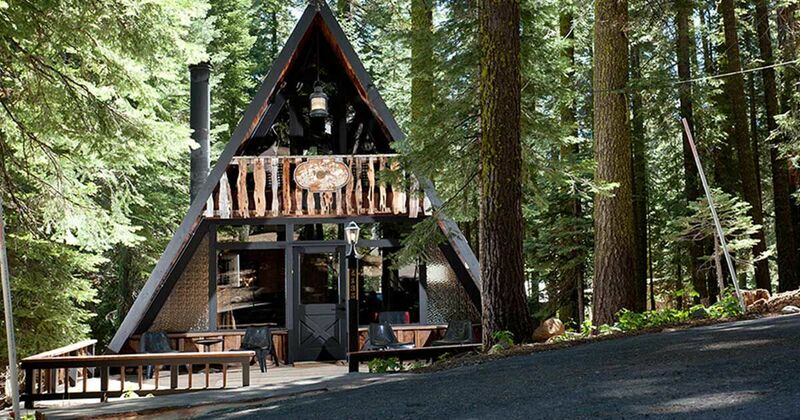 SHARE this A-frame cabin with your friends on Facebook!